Limited Time offer! Add the SEL 55-210 zoom lens OR the SEL 20mm f2.8 Prime Lens and save $100 instantly! You get incredible detail and gorgeous enlargements. Thanks to the large 16.1 megapixel APS-C sensor size and Sony Exmor APS HD CMOS technology, the camera achieves high resolution with no penalty in low-light sensitivity or sensor noise. A new zoom lever on the body of the camera allows for effortless one-handed operation and smooth zooming even when shooting self-portraits, bringing compact camera convenience to the realm of interchangeable-lens models. The NEX-3Ns tiltable LCD screen flips up 180 degree to make shooting self-portraits a snap. Include other people, experiment with interesting angles or shoot against famous landmarks. When you press the shutter, the camera does all the work. Record stunning high quality Full HD video4 in either 60i or 24p frames per second. Records in your choice of 60i/24p Blu-Ray quality AVCHD format, or in PC-friendly 1080/30p MP4 format. Perfect when an extra burst of light is needed to get the shot, the built-in Guide Number 6 flash2 combines with high ISO sensitivity to enable shooting in just about any setting. With a new Exmor sensor that features the same adaptive noise reduction technology from Sonys flagship SLT-A99V, the NEX-3N easily offers a wide range of sensitivity from ISO 100 to ISO 16000. Perfect for self-portraits or casual snaps, the natural form ensures quick, comfortable handling and makes the camera easy to carry around. In addition, the textured grip prevents slipping even when shooting one-handed or when using exceptionally large lenses. Measuring just 3/16? (29.9mm) when fully retracted, this SELP-1650 retractable zoom lens is super compact and easy to carry so you never miss the moment. It covers a 16mm to 50mm range (35mm equivalent = 24-75mm) for flexible shooting, and is equipped with one ED (extra-low dispersion) and four Aspherical elements, resulting in a high performance lens that is surprisingly compact. The NEX-3N includes 15 effects that can be applied to photos or movies, giving you the means to vastly expand your artistic repertoire. The ability to view effects in real-time on the LCD screen before the shot lets you experiment with different looks until you are satisfied with the result. NEX-3N provides easy access to most Picture Effect settings as well as controls for Background Defocus, Brightness, Color and Vividness. Just activate Photo Creativity, choose the appropriate item then adjust while viewing in real-time on the LCD screen. The ability to combine settings offers nearly unlimited creative control, and lets you compensate for tricky lighting. Use Superior Auto mode to shoot photos and movies with the ease of a compact digital camera. In this mode, the camera recognizes the current shooting environment then adjusts settings for optimal results. Superior Auto also includes Auto HDR and Hand-held Twilight modes, both of which employ image compositing technology to handle difficult lighting by recording multiple images at high speed then compositing them to produce the final photo. Get cleaner and sharper nighttime pictures?beyond the capability of traditional cameras without using flash or a tripod. 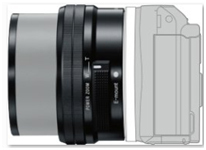 The camera leverages the large, APS-C image sensor and captures six images in a fraction of a second. Combining the data from all six creates a single image of extraordinary detail and low noise. Set NEX-3N to recognize faces and smiles. Face Detection locates up to eight faces in a composition then adjusts exposure, white balance and other settings based on these faces. Smile Shutter adjustable in three levels automatically takes a shot when smiles in the scene are at their brightest. Tailor the look of photos and movies before shooting. Choose from one of six settings Standard, Vivid, Portrait, Landscape, Sunset or Black & White depending on the scene or your creative intent.